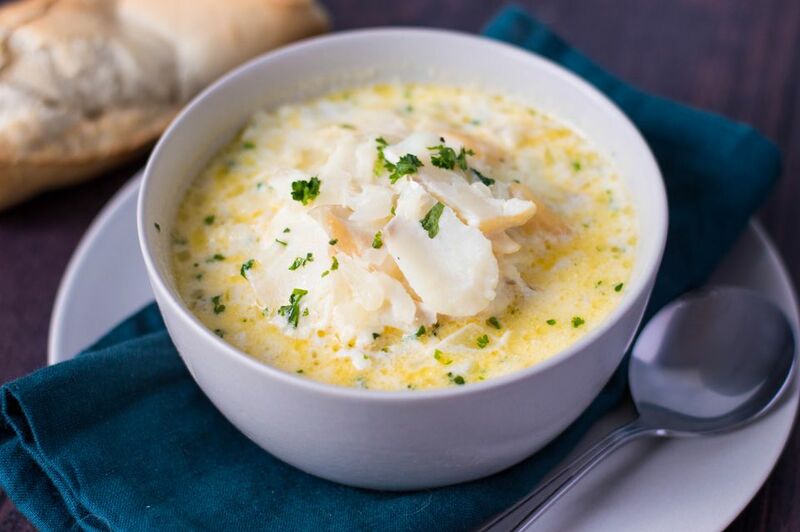 Cullen Skink is a hearty soup that is traditionally made with smoked haddock, and for me a great way to use smoked fish. The name of this soup originates from Cullen, a small town in North East of Scotland and also the home of this soup, one of Scotland's most famous dishes. In this version of the famous recipe, mashed potatoes are stirred into the soup creating thickness and flavor. In some recipes, however, instead of mash, scrubbed, new potatoes or potato chunks are added. The best potatoes for this would be waxier rather than the ones used for mash and Jersey Royals work very well. Pour the milk, parsley stalks, bay leaf, and haddock into a large, roomy saucepan. Finely chop the parsley leaves and keep to one side. Bring the milk to a gentle boil and simmer for 3 minutes. Remove the pan from the heat and leave for 5 minutes for the herbs to infuse their flavor into the milk. Remove the haddock from the milk with a slotted spoon and put to one side. Strain the liquid through a fine sieve and reserve the herb-infused milk. Heat the butter in another, smaller saucepan. Add the onions and cook gently until translucent - about 5 minutes. Be careful not to burn them. Add the milk and the potato to the onions and stir until incorporated and a thick, creamy consistency. Flake the smoked haddock into meaty chunks, taking care to remove any bones you may find and add to the soup. Add the chopped parsley leaves to the soup and bring to a gentle simmer and cook for a further 4 to 5 minutes. Do not over stir. If over stirred then you will break up the fish too much. Taste the soup and add salt and pepper as needed. Be careful with the salt, as the fish will impart quite a salty flavor all on its own. Garnish the soup with more chopped parsley or a little extra pepper as is your taste. Sometimes Cullen Skink is served with a softly poached hen's egg on top for an even more, filling soup. Or, lightly poached quails eggs dropped into the soup before serving, add a touch of sophistication if you are serving the soup on a more formal occasion. You can also add a cup of cooked or warmed, canned sweet corn before serving but this is not usual for a traditional for Cullen Skink, but occasionally it is fun to ring the changes.